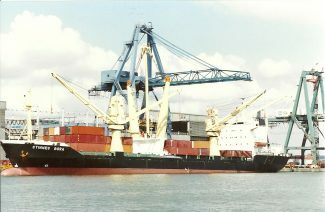 The vessel STINNES BORA in Tilbury on 6/87. RWJ? The containership STINNES BORA (8187 tons gross, 10,973 deadweight), was built in 1980 for a German owner as MAGDALENA WESCH. In 1986, it was sold to the Hamburg shipowner Hugo Stinnes and renamed BORA under German flag. It retained this name for just a few weeks, being renamed STINNES BORA in December 1986 with transfer to the flag of Cyprus. When photographed by Jack, STINNES BORA was in service between Hamburg and Buenos Aires, with Tilbury one of the intermediate loading and discharge ports. Sold in 1988, it became the Chinese-owned AN TAO JIANG. The vessel was in service under this name until 2010 and in 2011 was broken up at Xinhui, China.